Did LGI Homes' Management Raise Guidance Too Soon? The homebuilder raised full-year guidance just as home sales are slowing down for the first time in years. 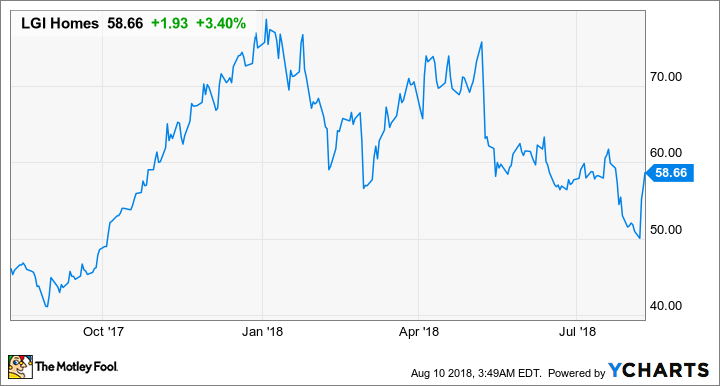 Homebuilder LGI Homes (NASDAQ:LGIH) produced yet another quarter of growth that outpaced its peers and allowed management to raise its full-year guidance. By any measure, it was a good quarter, but it was the first time in a while that LGI's results showed signs that home sales were starting to slow down. Did LGI's optimistic guidance numbers come a little too soon in the face of a potential market slowdown? Let's take a look at the company's most recent results and whether there are signs of concern on the horizon. DATA SOURCE: LGI HOMES EARNINGS RELEASE. EPS = EARNINGS PER SHARE. It's hard to find fault with LGI Homes' most recent result as the company reported a 48% increase in net income compared to this time last year. It was able to achieve that gain because of a 29% increase in revenue while maintaining a high gross margin -- 26.1%, one of the best in the industry -- and keeping its sales, general, and administrative costs to an incredibly low 4.3% of revenue. Most other homebuilders report SG&A expenses in the 9% to 11% range of revenue, so keeping its costs that low is truly a remarkable feat. One thing worth noting, though, is that LGI's revenue growth was a considerable slowdown from prior quarters. Home closings from Q3 2017 to Q1 2018 were all up at least 60% from the prior year's result, and Q2 2017 was a 34% gain on the prior year's result. It's hard to complain about 20% growth, but so much chatter about a slowing housing market does raise the question as to whether LGI is starting to hit some headwinds. Data source: LGI Homes earnings release. Chart by author. On top of opening several new housing communities in new markets in California, Alabama, and Oregon this past quarter, management also acquired private homebuilder Wynn Homes for $80 million. Adding Wynn gives LGI Homes a much larger presence in the Raleigh, North Carolina, area and adds 4,000 owned and controlled lots to LGI's development pipeline. Thanks to the company's second-quarter results and the recent acquisition, LGI increased its guidance for the rest of the year. Here's CEO Eric Lipar going through the details of LGI's 2018 guidance numbers. Based on these strong results in the second quarter, our proven operational performance and the acquisition of Wynn Homes, we are raising our guidance. We now anticipate closings, for the full year 2018, to be between 6,400 and 7,000 homes closed. In addition, we expect full year 2018 gross margin to be in the range of 24.5% and 26.5%, including the impact of expected purchase accounting, full year 2018 adjusted gross margin in the range of 26% and 28% and full year 2018 average sales price in the range of $225,000 and $235,000. Therefore, we are raising our full year 2018 basic EPS guidance from $6.00 to $7.00 per share to $6.50 to $7.25 per share. LGI Homes' management team has done an excellent job of targeting the first-time buyer with affordable homes, and the company's sales growth is a direct result of that success. Equally impressive is the company's ability to generate such high margins on sales despite selling a much lower price-point home. LGI's gross margins are some of the best in the business even though it doesn't sell into the more profitable luxury market. Management's reputation for growing sales and keeping costs in check is enough reason to believe management on its word that it can meet its revised guidance numbers. That said, there are some reasons for concern in its most recent closing data for the third quarter thus far. Home closings in July were down 8.9% compared to the same time last year despite the company having a much higher active community count in 2018 and the addition of Wynn Homes. Selling homes is a lumpy business, so it's entirely possible that it will be able to make up the difference in the rest of the quarter. Since LGI Homes doesn't release data on new orders and backlog, though, it's hard to know precisely how management made those guidance revisions. A decline in closings is reason to give pause when considering this stock even though it is priced at 8.3 times 2018 earnings guidance at the midpoint. There are some factors still working in LGI's favor, like a still-growing economy and a buyer demographic that is going to lean toward lower price-point abodes, but housing inventories are on the rise for the first time in a while, and overall affordability is becoming a hindrance to sales. It will be interesting to see how these trends play out in the second half of the year.